Today was a big day for God Before Government. Media outlets across the US covered our story and helped to spread the message that, as Christians, our service and commitment to God should be greater than our service and commitment to government–especially a government that coerces us to violate our commitments to God. Below are links to some of the media coverage from today which started with a headline on TheBlaze. We’ll be on Fox & Friends tomorrow morning on the 6am show, so stay tuned as #GodBeforeGovernment continues to grow. We have been encouraged by the overwhelming support we have received from Christians across the country the last few days. If you are just joining us, be sure to Like our page on Facebook, share it with your friends, and join the conversation so that we can continue this movement. Encourage your church leaders to fly the Christian flag on your campus and fly the Christian flag at your home. 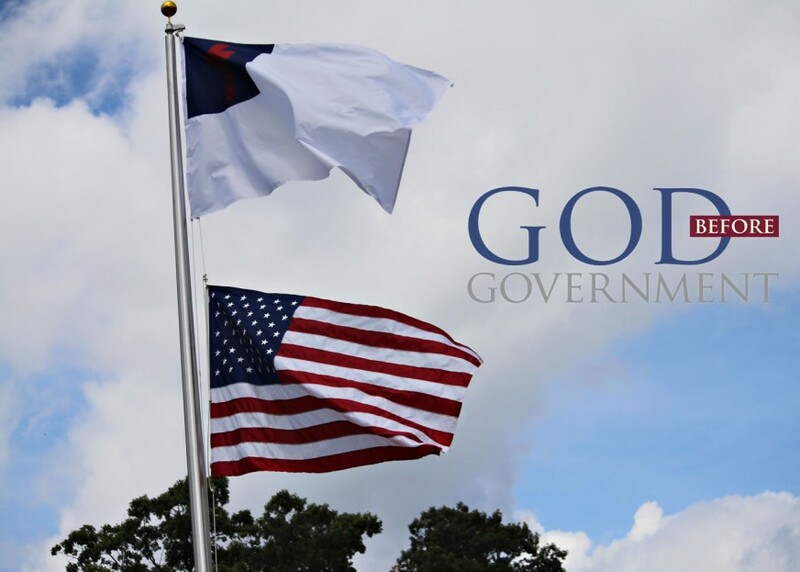 Send us a picture at [email protected], or post it to Facebook, Instagram, or Twitter using the hashtag #GodBeforeGovernment, and we’ll share it online. We are in this together! Our church does not display the American flag outside the church and only inside the church it is displayed before Independence Day. But never above the any of the heads of people because when they stand. We do not pledge our allegiance in the church to any but Christ. Praise the Lord of heaven and earth. That is the right place for the Christian flag. Christ Jesus fails not, ever prevais though Satan rails to derail us. where the Christian flag belongs, above all others. Thanks for the gesture. Makes my spirit fly high. Thank you Jesus. Finally a little bit of sanity among the insanity. It’s time we Christians take back our country and rededicate it back to God. God and He alone can save America, but it begins here and there’s no better place. Are now marked as enemies by the tyrants among us. Who are the tyrants you ask? Please pray daily for those in authority/influence. There’s still plenty of good guys out there, but the opposing forces of evil influence as the ancient words of our Holy scriptures command us. I’ve never been more serious about this in my whole life. His Peace be with you all. Through all of this let not our JOY and love for one another be stolen or grow cold.